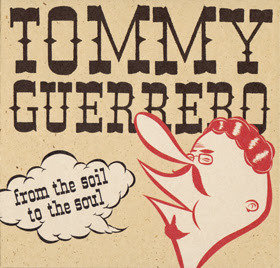 Formerly a high profile skateboarding professional of the eighties and nineties, Tommy Guerrero continues to transition his notoriously smooth style, creativity, and technical ability from the pavement to the studio as he settles deeper into his newfound career as an increasingly respected solo artist. On From the Soil to the Soul, he pushes his unique, jazzy, guitar-driven sound into a mature new realm. Highlights can be found early on in the album with “The Underdog,” a seemingly blues-inspired instrumental featuring a stripped down hip hop beat and “Badder Than Bullets,” which comes in with fast and furious drums and chopped up, cleverly layered guitar rhythms. Following the bold introductory offerings are “No Guns More Glory” and “War No More,” tracks that sound like something you would find on a classic Meters album—beautifully executed, straight-up, soulful funk jams. The album moves on with an assortment of mellow blues, Latin, soul, and jazz infused tracks. Guerrero effectively resuscitates things towards the end with “Let Me In Let Me Out,” an undisputed banger fronted by supreme funk-vocalist Lyrics Born. Fans of Lyrics will recognize this track as a surprising departure from his usual hip hop and funk style as he proceeds to unleash a furious vocal barrage to the backdrop of Guerrero’s hard rocking, distorted out lead guitar. With remarkably tight instrumentation and completely original songwriting found throughout, From the Soil to the Soul delivers the goods. Bluesy, soulful, funky, melodic, sometimes dreamy, and even hard-rocking, Guerrero’s album takes you on a wild and eclectic, yet surprisingly impressive and enjoyable ride.